The Crystal System is all about finding clarity in your approach and keeping things simple. By simple I don’t necessarily mean ‘less’ but actually finding the heart of the matter. Reducing what you need to do to its very essence ensuring nothing more could be taken away without it becoming ineffective, likewise, anything that you add is unnecessary and would only really create clutter and confusion. All that we aspire to do will go through an evolution; a cycle of development until the process finds its ‘essential state’. Learning something new usually creates some seemingly chaotic input, making it hard to separate the relevant and essential elements from the irrelevant. As you learn more you start to set the pieces of the puzzle together for yourself, eventually arriving at the mastery stage. Let’s take a look at some of the most straightforward subjects in dressage training and try to find the heart of them – beginning with riding a 20 metre circle. The 20 meter circle is one of the most important training figures in Dressage, from the introductory tests through to Grand Prix, in fact it could be said that the 20 metre circle is at the heart of all Dressage. 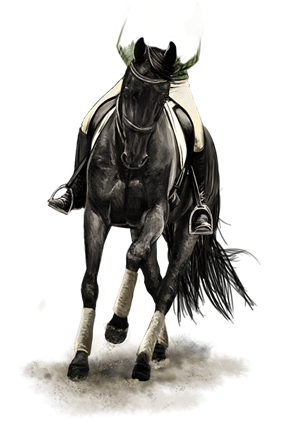 It is one of the first figures taught to beginner riders and young or green horses. Due to its size, it doesn’t require that the horse or rider have incredible skills to be able to ride moderately well, but one thing is for sure, if you don’t pay attention to perfecting your circle work, with the goal of unconscious competence (mastery), you will not become sufficiently skilled to move up the levels. Now I really don’t want to be stating the obvious, but I feel I must – the 20 metre circle should be round! NOT egg or pear-shaped. 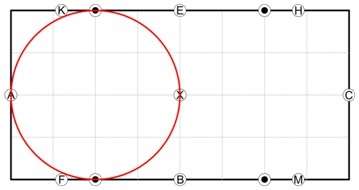 Each side of the arena (where the circle touches the outside of the arena) should only be met at a single point (as shown in diagram). This means that you do not ride along the outside of the arena for any period of time. There are absolutely NO straight elements to a circle and your horse should bend throughout. Touch the sides and immediately off. Many riders tend to go too deep into the corners of the arena, creating a bulge in their circle. 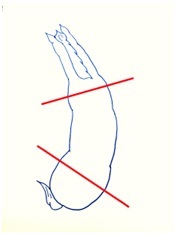 This indicates that the horse is not correctly bent on the circle, or that he is leaning, falling in or out through the shoulder. Ensuring that the shape of your circle is correct forces you to control the horse’s balance, if you make a wishy-washy circle or do not put in sufficient effort you succumb to centrifugal force and lean in. The 20 metre circle is a primary exercise to improve your horse’s ability to bend, to improve his overall suppleness and to encourage him to engage his hindquarters. Finding the heart of the matter relating to bending your horse will be the subject of another blog. For now you need to know that it is YOU that CREATES the bend. It doesn’t just happen when you decide to ride a circle! Incorrect position or application of the aids will often become apparent on the 20 metre circle. Make a connection between inside leg and outside rein. Control and channel all of your horse’s power on the direction of the circle. Keep the tempo consistent. It is the alignment of your hips and shoulders on the circle that regulate and show your horse where his hips and shoulders should go. I am often asked about where the seat-bones should be on a bend/circle. Putting too much weight on your inside seat-bone will also make you lean to the inside the circle, too much and you will lose contact with the outside seat-bone thus encouraging your horse and yourself to ‘fall in’, particularly if you are weak through your core. My view is that you should always make sure that you have contact on both seat-bones and just encourage the inside seat-bone forward slightly on a bend. When I say slightly, I mean slightly. Moving on a circle or corner is all about the inside to outside aids. Use your inside leg to encourage the bend, use your outside leg to control the haunches and direct the outside of your horse around into the turn. Hold the inside rein softly and encourage the horse into the outside rein with the inside leg, whilst ensuring that your outside elbow is connected to your side with a quiet contact. The softness on the inside rein is a consequence of a proper bend and balance. Be very, very subtle about the use of your seat-bones. Experiment with weight until you get it right. The weighting is barely perceptible. Remember, less is more. It helps to think on your inside leg as a pillar around which your horse’s body will bend, but you should always be aware of remaining upright and connected through your seat. If you are struggling, check that your inside thigh is connected to the saddle. Master these three elements and you’ll be able to ride your circles for a 9. Guest Post: Is being a great rider out of your reach? I have been riding most of my life and it seems the circles are still something I’ve yet to perfect. The arena I school in is slightly sloped. Are there any secrets to riding a beautiful 20-meter circle on a slope?